"So Krishna consciousness is in the absolute platform. There is no relativity. In the temple worship, as there are so many different duties -- one is worshiping directly the Deity, decorating the Deity, and the other is washing the temple -- it does not mean that the one who is cleansing the Deity, he is less important than the person who is in the temple room, Deity room. No. Because it is absolute. The Deity... As the Deity is important, similarly, the floor of the temple is also important, same importance, because absolute. So in executing our devotional service we are engaged in different duties. Somebody is cooking. Somebody is decorating the Deity. Somebody is cleansing the floor. Somebody is going to sell books. Somebody is doing something. Everything -- nirbandhe krsna sambandhe, in relationship with Krishna. Because the relationship is there with Krishna, then every activity which you are doing, that is complete. There is no such material distinction. Just like here in the material world somebody is sitting in the office chair and somebody is cleansing the office, so the cleaner is supposed to be lower than the officer, but in the spiritual world there is no such distinction. The officer and the cleaner, they are of the same importance. That is even Krishna, with Krishna. That is spiritual world. In Vrndavana the cowherds boys, they are playing with Krishna on equal terms. They do not know Krishna is God. They simply know how to love Krishna, that's all. There is no need of thinking that 'Krsna is greater than the other cowherds boy. They are living entities.' There is no such sense. Krishna wants that. That is Goloka Vrndavana worship. Simply the center is Krishna, and all the inhabitants of Vrndavana, they love Krishna, and they do not know anything except Krishna. This is Vrndavana life. 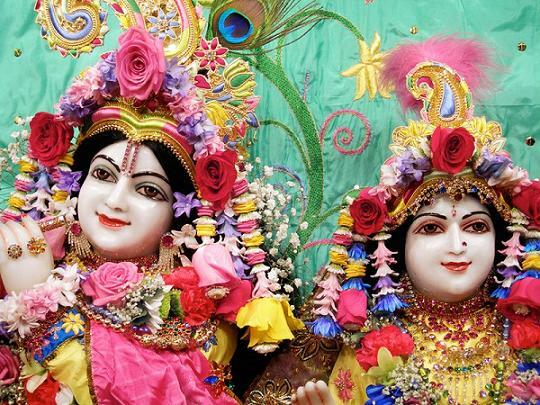 Everyone knows that 'Krishna is my very intimate friend.' Somebody knows, 'Krishna is my son,' somebody knows that 'Krishna is my master,' and somebody is thinking, 'Krishna is my lover.' But center is Krishna. The cows, the calves, the friends, the gopis, and the cowherds boy, Krishna's father, Nanda Maharaja, Krishna's mother, Yasomati, and... Everyone's center is Krishna, 'How Krishna will be happy?' This is Vrndavana life. If we try to follow the footsteps of the residents of Vrndavana, how to love Krishna, then our life is successful."